"A gay couple who innocently made a late-night stop at a White Castle in Staten Island was among the latest in a skyrocketing number of hate crime victims in the city." 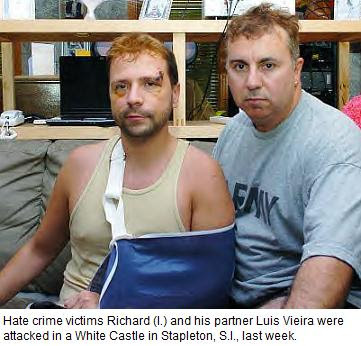 For married couple Luis and Richard Vieira, the attack on July 7 began with a homophobic slur. "He looked at Luis and said, 'What the f--- are you looking at, f-----?'" recalled Richard Vieira, 39. A teen punched Luis in the back of the head. The couple, married two years ago in Massachusetts, stormed into the parking lot of the Stapleton fast-food joint to confront the foul-mouthed brute. Suddenly, they found themselves surrounded by more than a dozen teens. Luis dashed back inside the White Castle, but Richard was knocked to the ground and pummeled. "I was left unconscious," said Richard, his face still bearing the bruises and cuts he suffered. "This is our home ...nothing bad has ever happened to us until that night."